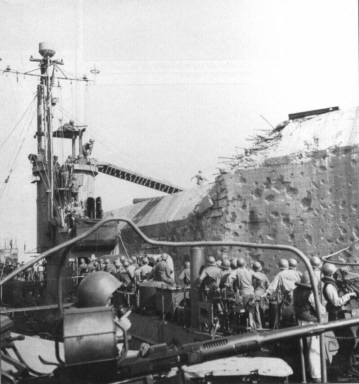 The day President Roosevelt died, USS LSM 51 proceeded on a mission described in Time Magazine as one of the oddest of the War. The following is an account of the Blasting of Fort Drum as it appeared in YANK (The Army Weekly) August 3, 1945. The earlier taking of Caballo was the inspiration for the plan by which the 38th Division cracked Fort Drum. Caballo was a horse-shaped rock and most of its garrison had been knocked off within a few days. A band of 60 survivors, however, had been able to take refuge in two huge mortar pits which resisted all efforts of infantry, engineers and artillery. They were of reinforced concrete and at least 20 feet thick, another case of an installation built by Americans and improved by the Japs. A plan was formulated by LTC Fred C. Dyer of Indianapolis, IN, G-4 of the 38th. An LCM was fitted with a centrifugal pump and two tanks capable of holding more than 5000 gallons of liquid. A special mixture of two parts Diesel oil and one part gasoline was mixed and then pumped into the tanks.The mixture of oil and gas - 2400 gallons of it, was then pumped in the pits. Tracer bullets were fired and set fire to the pits. Only charred Japs were found when the flames died down. In actual time of pumping oil and setting fuses, it had taken just over 15 minutes to settle the fate of the "impregnable" concrete fortress. It had been a successful operation in every way but one: The souvenir hunting wasn't very good. Story filed by SGT Thomas J. Hooper, Field Correspondent. Other war correspondents coming on board included Walter Simons, Chicago Tribune, Lindesay Parrod, New York Times, Frank Kelly, New York Hearald Tribune, Guy Richards, New York Daily News.